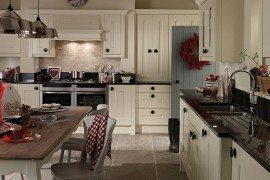 Over the past few days we have showcased various ideas that celebrate the joy of Christmas in often neglected spaces such as the kitchen and the dining room. 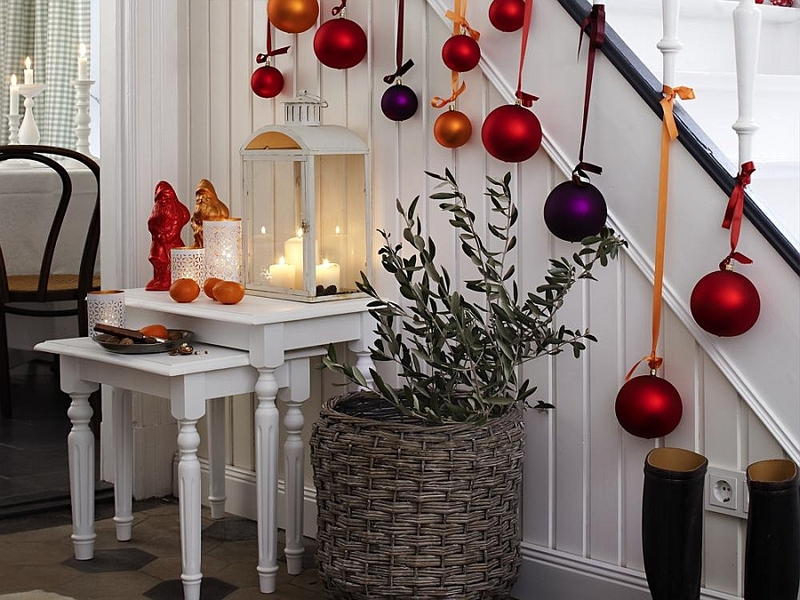 Today we take a look at another area of the house that might not be on top of your ‘places to decorate’ list this Christmas, but can make a huge visual impact when properly decked out. 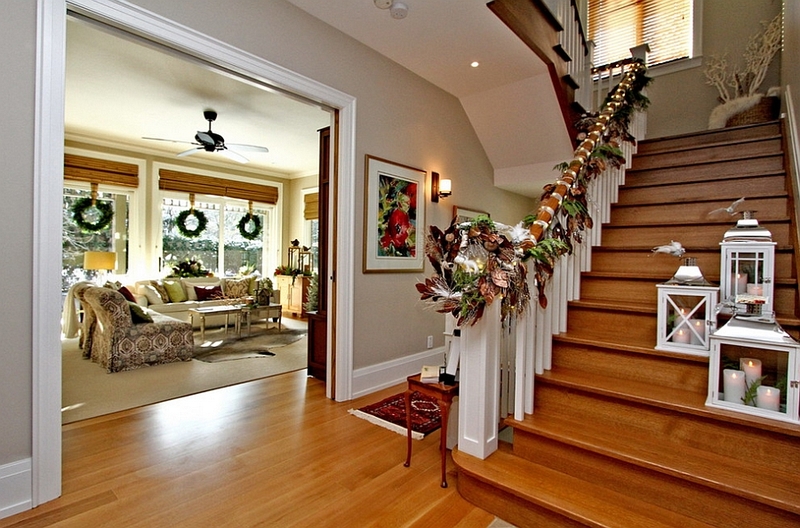 While most of us think of the staircase as only a functional addition, it obviously plays a big role in determining the aesthetics of the entry, the living room, or any other area it shares space with. And this Christmas, make sure you give it a grand makeover with gorgeous ornaments, tinsel, lights and a whole lot more! 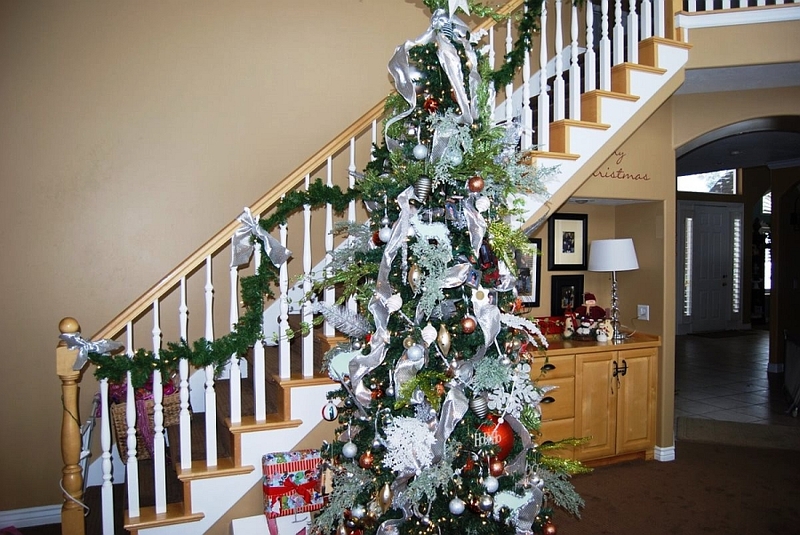 One of the first things to do is to consider the style of your home and how the staircase decorations will work with the overall Christmas theme that you have going. 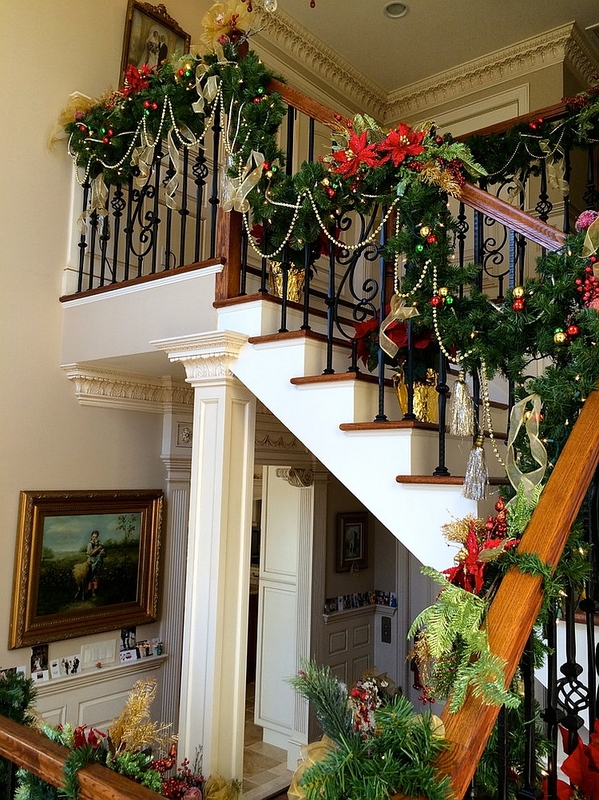 There is no point in going for a traditional ‘green and red’ look with lavish Christmas garlands and wreaths when you have a minimal home and the colors around the staircase are predominantly yellow or blue! 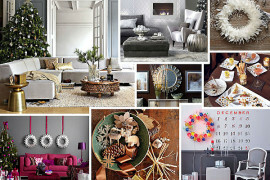 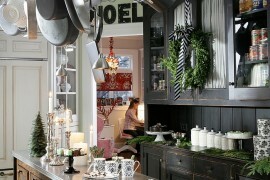 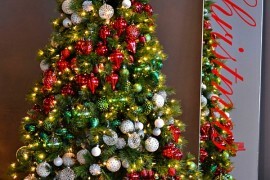 The idea is to bring the goodness of the holiday season while extending the existing color palette and theme. 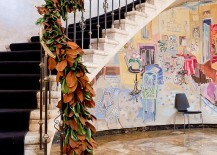 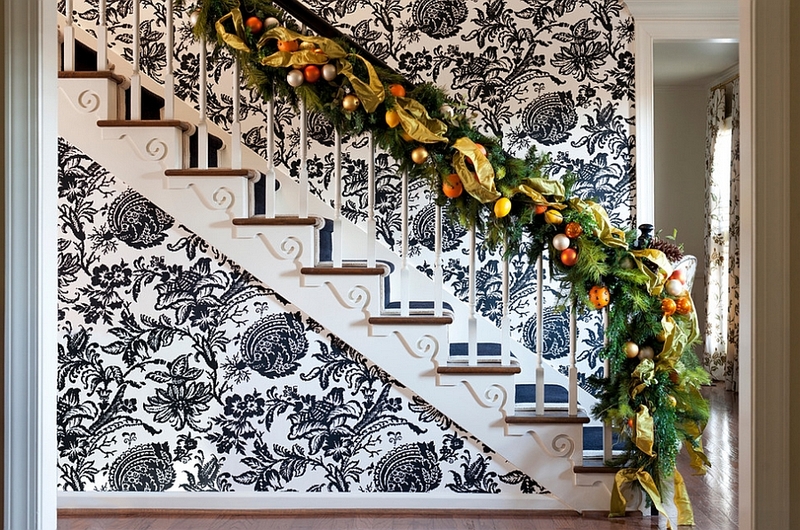 Less ornate and more innovative staircase garlands look lovely in modern and contemporary homes. 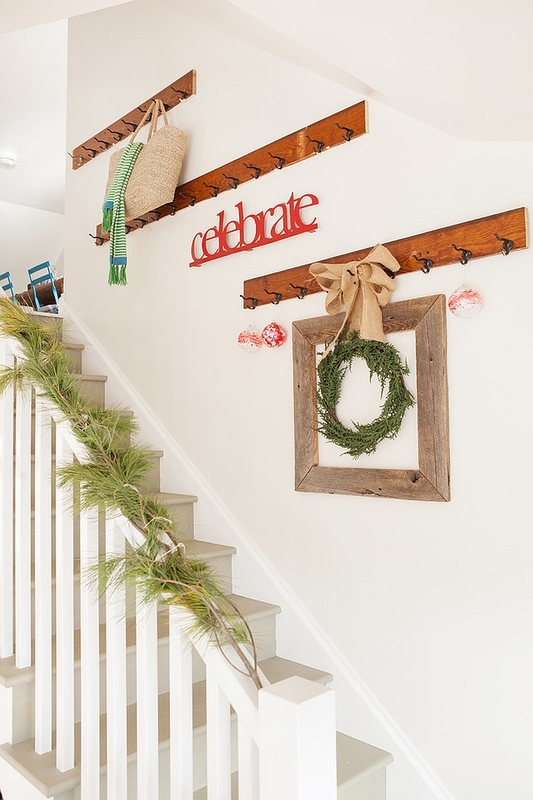 For a rustic look, turn to natural materials, branches and burlap. 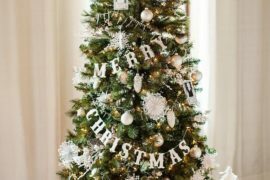 If you have a lovely, Scandinavian-style, all-white backdrop, then think about a few hand-blown glass ornaments and shiny baubles that will add color while maintaining the clean, uncluttered look. 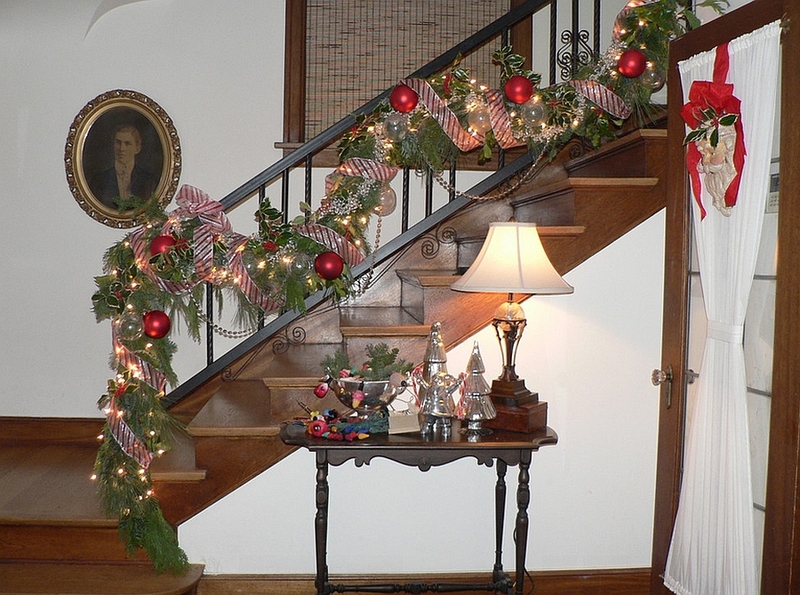 And if your focus is to keep the kids in the house happy, go with large figurines, suspended angels, bright stars and giant stockings. 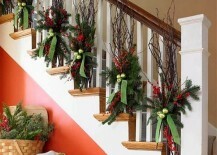 Do not limit yourself to the simple green and red classic decorating style come this holiday! 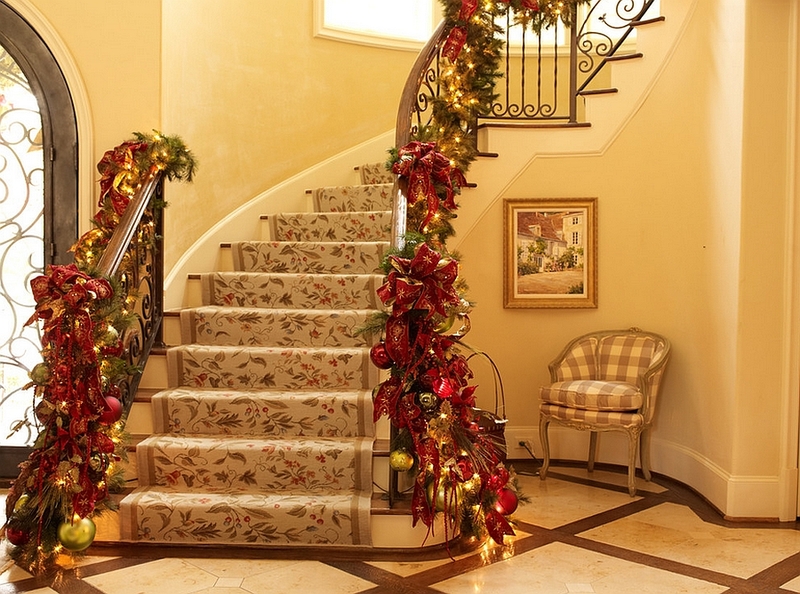 If you’re still going to stick to the tried and tested look with green garlands and sparkling red ornaments for the staircase, then do so with plenty of pomp! 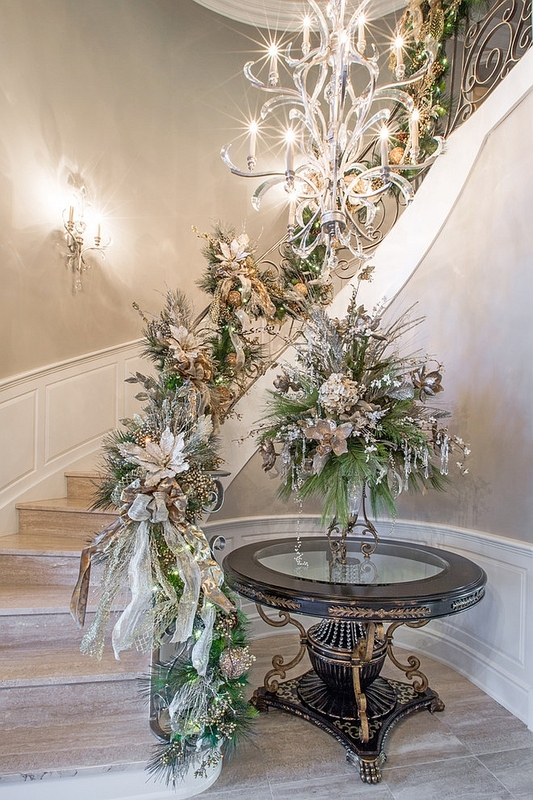 Metallic accents are a big hit this holiday season, and you can incorporate them into your staircase decorations as well with pops of brilliant gold and silver. 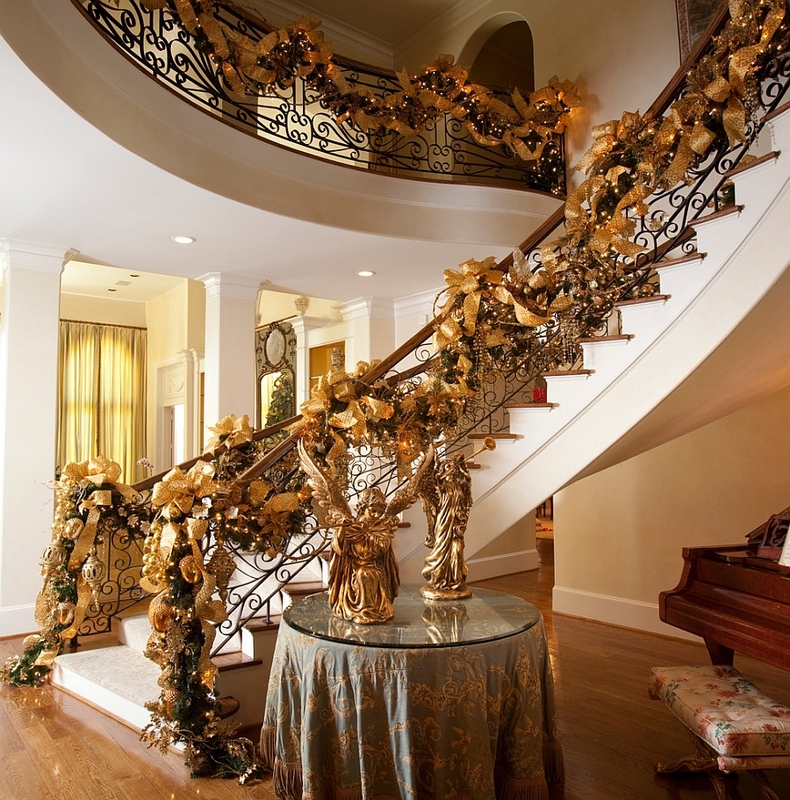 In fact, you can take the traditional decorating approach and switch over completely to a golden color scheme to give the staircase a majestic and captivating appeal. 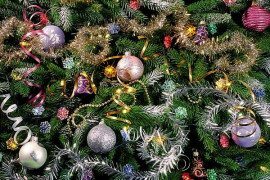 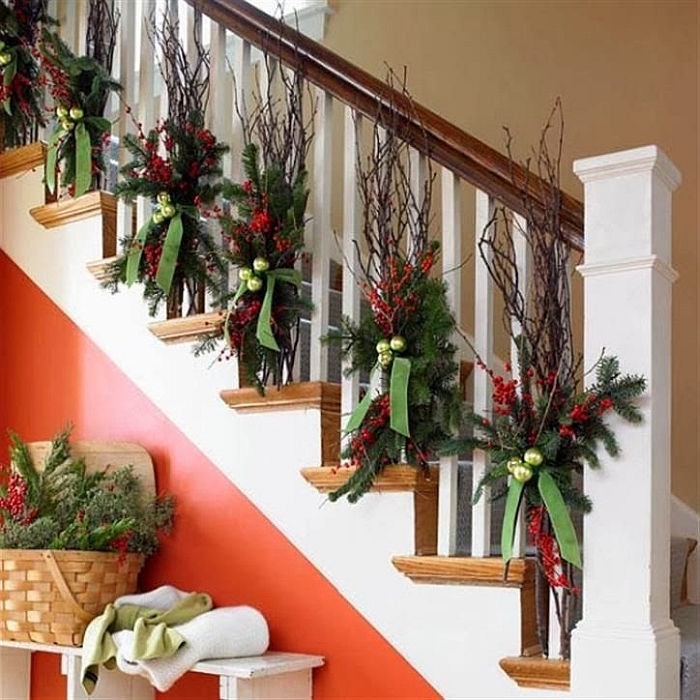 Elegant DIY wreaths and decorations that complement your festive Christmas tree next to the stairs give the entire interior a more coherent and charming vibe. 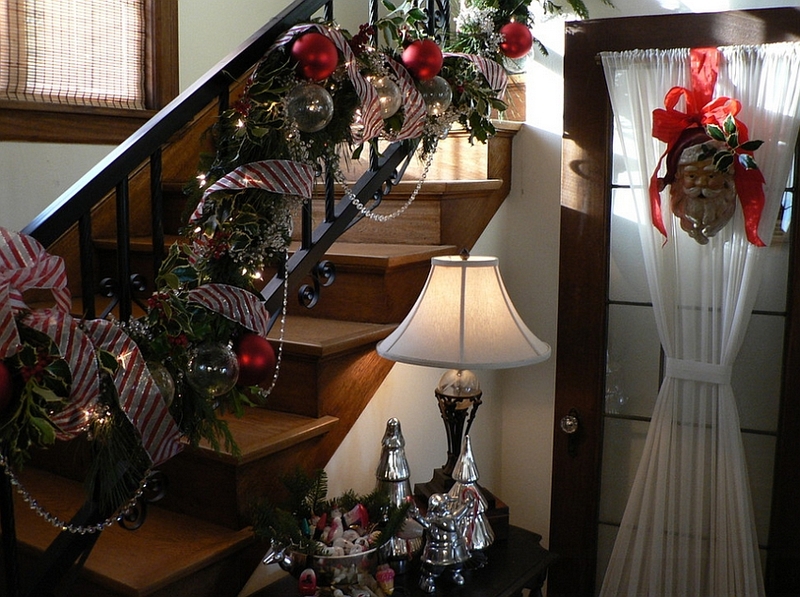 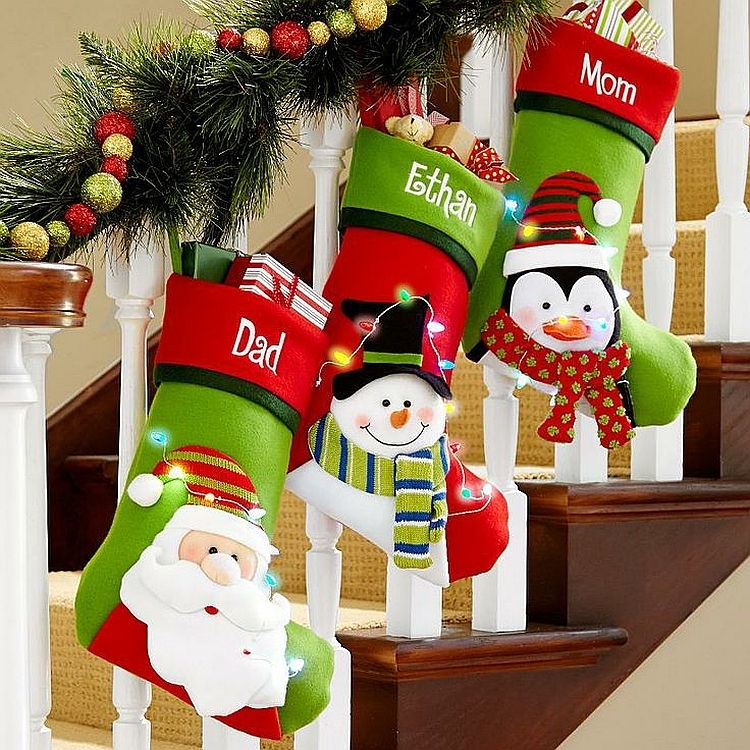 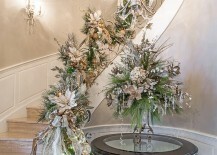 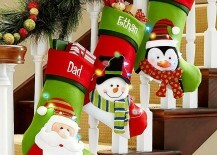 Decorating the staircase does not mean you only deck out the railing with ornaments, garland and wreaths. 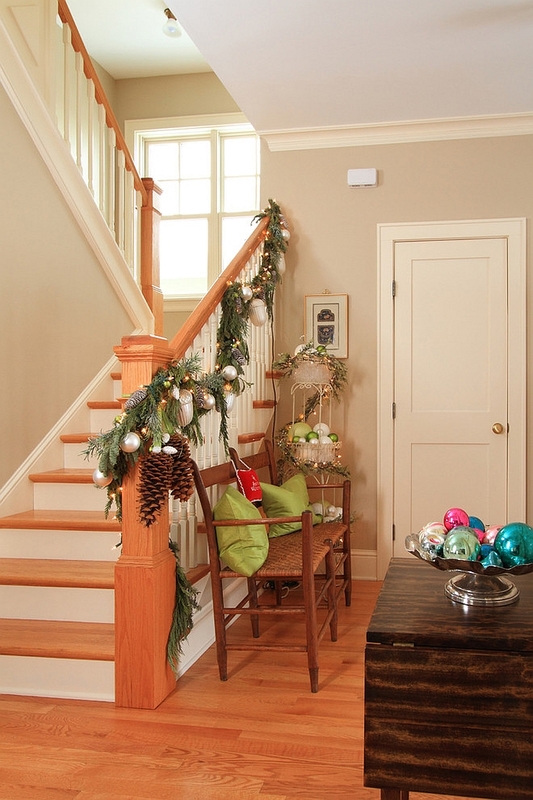 Think of the staircase landings and the little nooks underneath the stairs and fill them with creative holiday decor to complete the look. 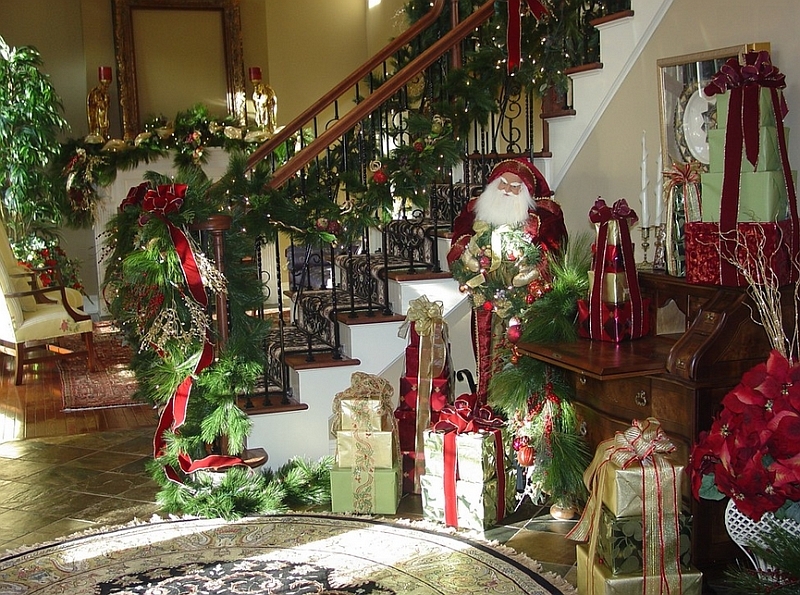 A table or console with Santa figurines next to the stairs, a sparkling Christmas tree or beautifully wrapped and stacked gifts for the family are all great choices. 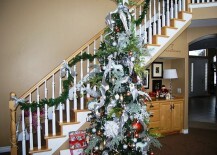 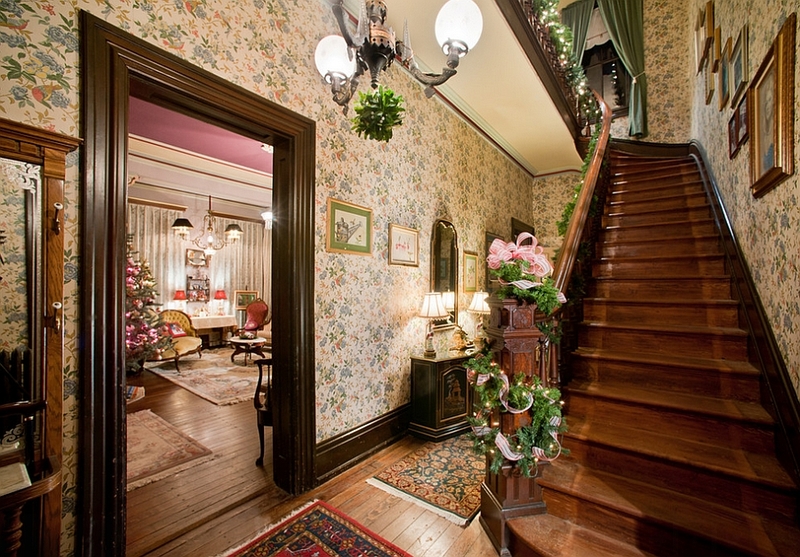 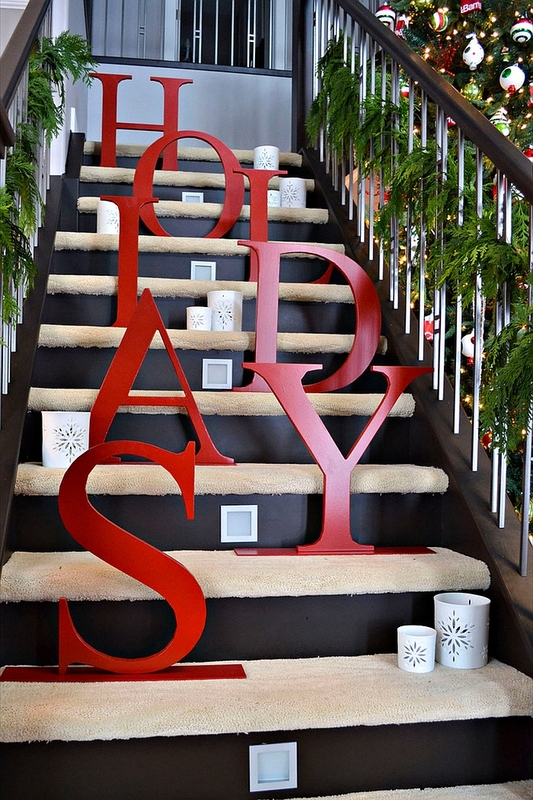 As with every other aspect of interior design, do not forget lighting when decorating the staircase for the holidays. 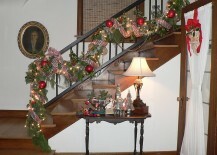 String lights are the obvious choice, and it barely takes any effort to put them up along with a beautiful garland and some unique felt Christmas ornaments. 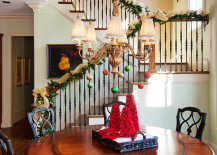 Make sure that the ambient lighting is just right and not too overwhelming, as this might drown out the sparkle of the carefully placed string lights. 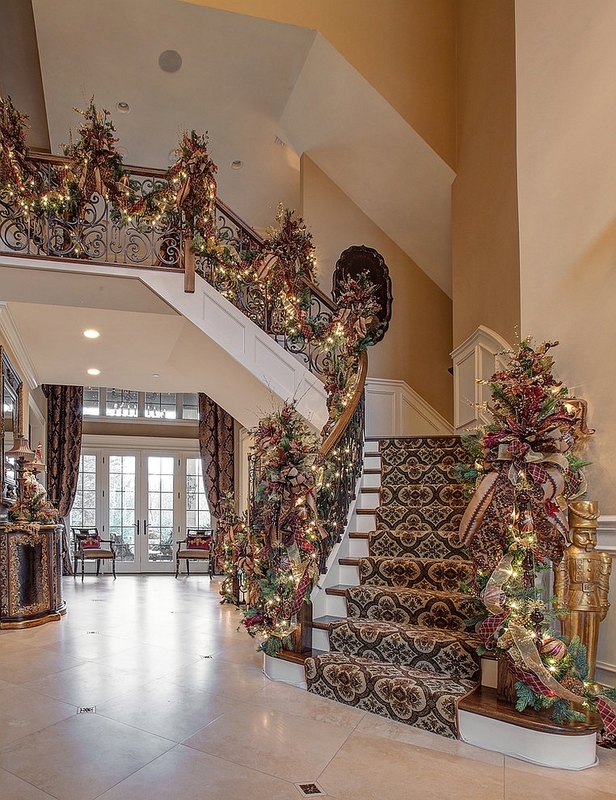 Using both silver and gold ornaments will further enhance the appeal of these flickering lights and give the interior a surreal, dreamy vibe. 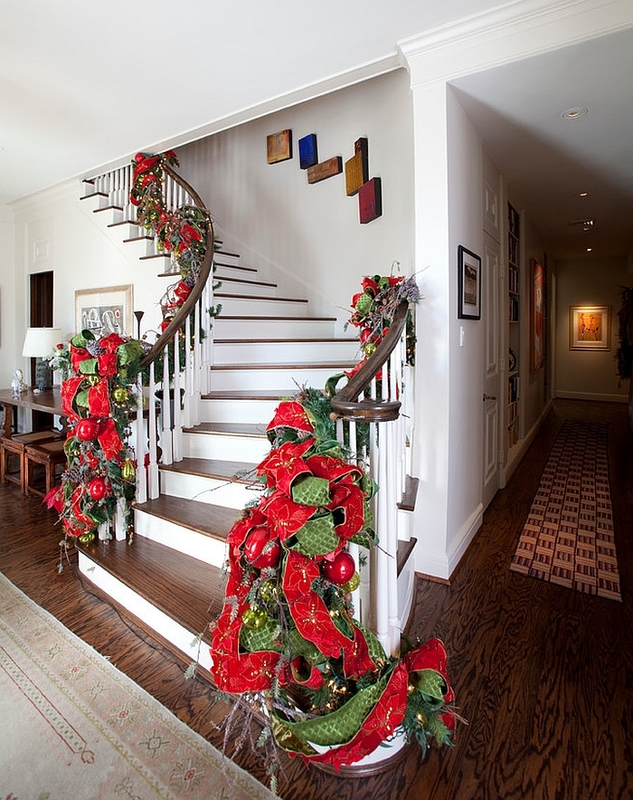 Whether it is the staircase leading to the basement or the grand spiral stairs in the entrance, decorate them delightfully this Christmas and you will instantly notice the big difference that they make. 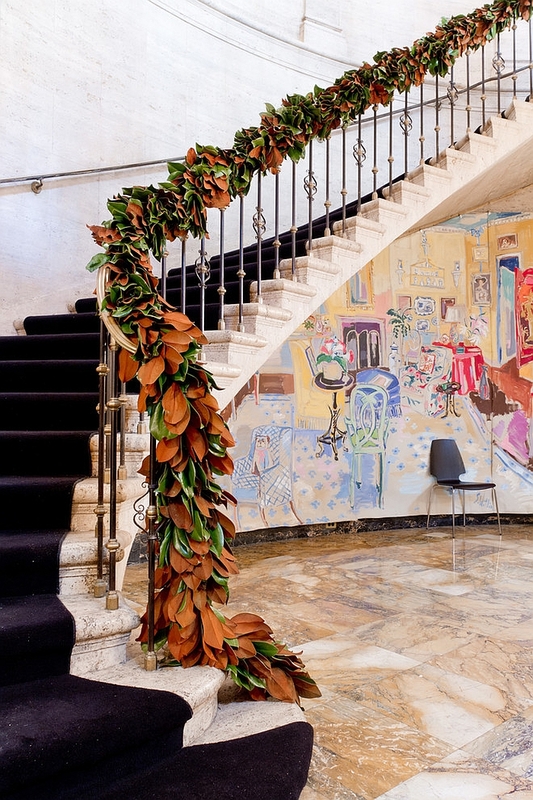 It’s a sculptural eye-catching feature that will steal the show every single time! 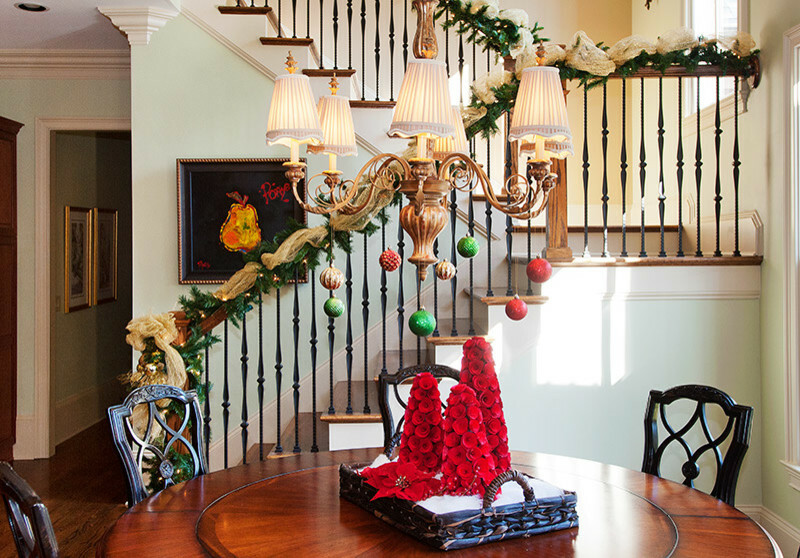 21 Christmas Dining Room Decorating Ideas with Festive Flair!